Provide comfort for the family of David Jones with a meaningful gesture of sympathy. 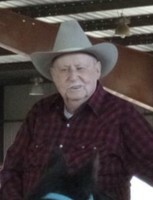 Ringling - Funeral Services for Mr. David Arthur Jones, 86, of Ringling are scheduled for 2:00 PM Monday March 25, 2019 at the Apostolic Church of Jesus Christ with Bro. Billy Holder officiating. Interment will follow with military honors at the Ringling Memorial Cemetery. Services are under the care and direction of Alexander Gray Funeral Home of Ringling. David was born on Feb. 27, 1933 at Lowell, MA to the late Mr. Arthur C. Jones and Mrs. Ann Grand (Mason) Jones. He departed this life on Thursday, March 21, 2019 at the Healdton Hospital. David was raised in Clemsford, MA attending school there where he graduated from High School. He joined the US Army in 1953 and served as a military policemen until being honorably discharged in 1955. David married the former Mary Signorelli and they were blessed with 3 children. They moved to Texas in 1962 mostly residing at Desoto. Later in life David would marry the former Dora Willeford on Feb. 1, 1980 at Irving, TX. This union united two families having a total of six children. David operated a bull dozer and other heavy equipment most of his working years. 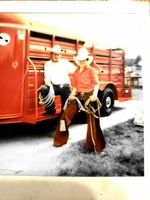 He retired in 1989 and enjoyed being at his acreage with all his cows, horses and other animals. He and Dora moved to Ringling last year where they both have enjoyed attending the Apostolic Church of Jesus Christ. Survivors include his loving wife Dora of the home; children, Debby Handy of Midlothian, TX; the late Margaret Meador and her husband Jeff of Midlothian, TX, Kevin Jones and wife Tammy of Boonesville, TX, Cindy Jo Holder and husband Billy of Ringling, Gerald Willeford and wife Rhonda of Ringling and Kenneth Willeford and wife Brandi of Larkinsville, AL; sister, Tina Maxfield and husband Bookie of Dracut, MA; brothers, Robert Jones and wife Edie of MA and Buddy Jones; 16 grandchildren and 11 great grandchildren; numerous other family and friends. Casket Bearers are Joshua Burnett, Colton Burnett, Randy Simons, Robert Simons, Weldon, Simons, Mason Meador, Matthew Meador, Derek Patrick, Brittani DeMoney and Jennifer Meador. Family visitation will be held from 4pm to 6 pm Sunday at Alexander Gray Funeral Home of Ringling. In lieu of flowers please send donations to St. Jude Children's Research Hospital at stjude.org. To send flowers in memory of David Arthur Jones , please visit our Heartfelt Sympathies Store. Donations are being accepted for: ST JUDE INC. Provide comfort for the family of David Arthur Jones by sending flowers. So sorry for your loss. May the scriptures found at Acts 24:15 and John 5:28,29 bring hope and comfort.